Colombians rejected a landmark peace deal in a shocking vote this past weekend. On Monday, the country's currency and stocks reacted negatively. Colombia's peso fell 2.6% Monday. Stocks fell too -- the MSCI Colombia, which represents the country's largest publicly-traded companies -- quickly shed 3% once markets opened. "The rejection of the proposed peace deal was not expected nor discounted by the market," says Alberto Ramos, head of Latin America research at Goldman Sachs. 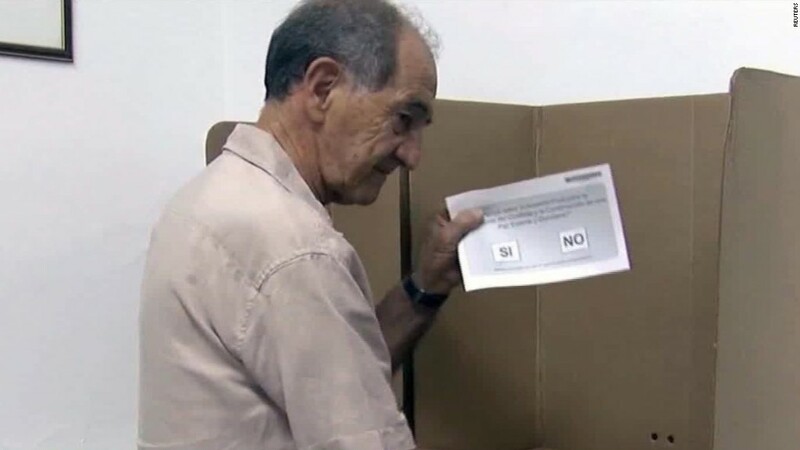 In a referendum vote on Sunday, Colombians voted against a peace deal with the rebel guerrilla army known as FARC that would have ended a 52-year civil war. The conflict killed an estimated 220,000 people and displaced millions. It took four years for the Colombian government and FARC leaders to reach a deal. Colombia's president, Juan Manuel Santos, wanted the Colombian people to ratify the peace deal in a referendum vote. But Colombians narrowly rejected the deal, with 50.22% voting against it. Many Colombians believed the deal would have been too lenient on FARC leaders who committed war crimes. Colombia's economy already faced a litany of headwinds despite being one of the best performing economies in Latin America. The peso fell 18% and 25% against the dollar in 2014 and 2015 respectively. It had started to regain momentum this year. But now things appear uncertain. After growing at 6.6% in 2011, Colombia's economy slowed down over the years, only growing 3.1% last year. Its chief export is oil and low crude prices have hurt its growth prospects. Santos -- along with many economists -- argued that peace had major economic benefits. They anticipated that peace would increase stability, encouraging more foreign investment and the development of FARC-controlled territory. Although the failed deal isn't expected to cause an economic crisis soon, the shocking outcome raises concerns, experts say. "There is still a lot of uncertainty about what comes next," says Adam Collins an economist who covers Colombia at Capital Economics, a research firm. The no vote "does raise political risks."